I'm caring, kind, trustworthy and very patient, with a gsoh. I treat others like I want to be treated. I believe in honesty from the start. I enjoy most kinds of sport. I enjoy art, theater, concerts, travelling. Anything new. I'm looking for a warm, kind and caring person who is trustworthy and faithful. Someone who will share the same interests and bring new ones. That someone special to share the ups and downs life brings. Will know when I meet her. bqms is a Male dating in Westmeath, Ireland. 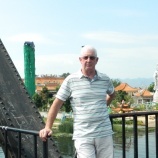 Check the description of this 59 years old profile, he is White/Caucasian and Christian maybe this matches your profile description and you can both start dating in Ireland for free. The stars says he is a Aquarius maybe you should check your horoscope and match up your star sign.